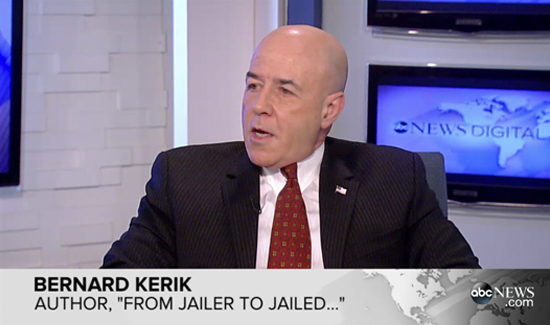 Remember when Bernie Kerik was the golden boy of law enforcement? At the turn of the millennium, the then-mustachioed head on the NYPD under Mayor Rudy Guiliani was flying high, with crime in the Big Apple down and worldwide acclaim following the department’s response to the terror attacks of 9/11. But it would all soon come crashing down. Extramarital affairs, employing an undocumented immigrant as his child’s nanny, ethics violations, and most damaging, tax fraud, which landed him a four year prison sentence (in his ruling, the judge called Kerik a “toxic combination of self-minded focus and arrogance.”). Now, former inmate #84888-054 is a free man and making the rounds on the media circuit and hawking his new book, From Jailer to Jailed.” In it, Kerik reveals not only recalls his life in law-enforcement and the demons that caused him to throw it all away; it also acts as a soapbox for his latest incarnation: an advocate for criminal justice reform. Interesting questions, indeed, especially coming from someone who’s sat prominently on both sides of the situation. Check out the link below for more on the story, plus his take on the NYPD’s ongoing beef with Mayor DeBlasio, combating terrorism, and more. I don’t think we have the right to judge him…..he has been judged and has paid for his crime. MAYBE he can do some good after all he has certainly experienced both sides of our justice system. Let us give him a chance. What did the cop on the street and in the patrol car say about his leadership? Were they for him; then let it be.